Can’t lie, won’t lie, this episode started out, well, as a pretty regular 23min of Ska episode… then I thought “with a title like “Spanish Blood” I should at least get some Spanish in this episode.” Then things took a turn for the better, or rather, a turn for the awesome. I hope you dig it, I enjoyed digging into some artists that while I was familiar with, I never had taken the time to get to know a lot better, so I got to know them to get this great bunch of songs together! Thusly, we all benefit! 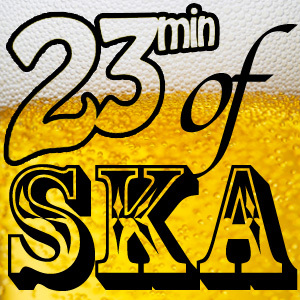 Four years ago today I debuted the first episode of 23min of Ska. I had been involved in a weekly (sometimes twice weekly) podcast with my wife since ’08 and had gotten a real handle on the ins and outs of doing a podcast. I had wanted to do a ska podcast a few times, but was never sure what I really wanted to do. An interview show? A DJed radio like show? Me and a friend talking about ska music, sharing stories and playing some music in between? I was also tossing around the idea of doing a music mixtape project/podcast based on the LA subway system w/ each color line representing a genre, but abandoned that due to its insane nature. Also because I knew that would never take hold anywhere. Then I was just like “Oh hell, I’ll do my ska podcast like that plan, plus it’ll be easier, because I won’t have to know average times between red line stops for episode times!” How foolish, because as soon as I was getting started on the first episode I was ready to saddle myself w/ a time constraint anyway. At first it was going to be 15min of Ska, and it was going to be monthly. I thought I could keep up at that pace while still doing my other podcast. As I put it together I realized that 15 minutes would be too short for a monthly show. So I upped it to 23min and decided that new episodes should drop on the 23rd of each month. After I’d posted the first one, I decided that I’d been hasty, and that there should be two episodes a month, on the 11th and the 23rd. That would also equal 23 episodes a year (provided I always took Jan. 11th off). That sat well with me. After the first year I launched the facebook page and removed a lot of my personal info from my blog and made it the official 23min of Ska website. I also added interviews at the top of each month. This way I was still getting 23 episodes of music a year. Somewhere along that year I found that the idea of a show that updates on the 1st, 11th and 23rd of the month got confusing for regular listeners and a lot of them thought that the show was released each Thursday for some reason. So starting in 2012 the show went weekly w/ interviews, 2 regular music episodes a month and 1 special music episode a month landing on Thursday morning. In my idiotic mind the special (and sometimes bonus if there was a 5th week) episodes didn’t count to the 23 song cycle. I’m an idiot, I don’t think anyone noticed my stupid numbering system. Which brings us to last year, this is when I figured I was all “Eff it! 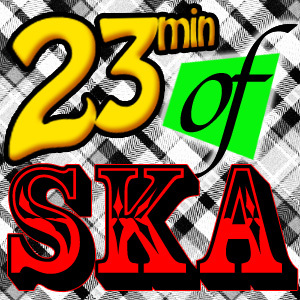 No one notices that an official session of 23min of Ska is 23 episodes! I’ll just go weekly, and the episodes that don’t count (All ’60s ska eps, the occasional interview, guest mixers, May Mix Tapes) will be obvious, and won’t be tied to the calendar.” So here, on the 4th anniversary of the show and the 5th set of 23 episodes is coming to an end. That’s far too much insight into what I think about when I’m doing this show, but for my brand of crazy it needs to be there. Next week I’ll return to start the 6th cycle of 23min of Ska, I’m already planning the May Mix Tape too, and hope that I can scrap together another ’60s ska episode as well sometime in March. So that’s at least another half a year of this podcast to look forward to! Let’s hope by the time I get there that I won’t want to toss in the towel, because so far this is a fun gig, and I’ve met wonderful ska fans and bands while doing this, heck I even launched a record label! Thanks to all you wonderful listeners, and tell all your ska loving friends! I really want the next 23 episodes the most downloaded & played yet!